I have working classifications for the sorts of books and related material that I purchase. There are books that I want to see on our shelves and so we need physical copies. There are things that I feel I'll only read on my Kindle or as a digital comic. And more recently there are Audible audio books that I listen to while walking. For one reason or another, Hamilton: The Revolution ended up being classified as something I'd secure as an audio book because...reasons? I guess it's not something I imagined that I would ever get around to actually "reading" and so it's now something that I've listened to instead. It did prove to be an interesting enough experience and a nice change of pace from my usual audio book biographies. Synopsis: Hamilton: The Revolution is a sort of biography of the hit Broadway musical Hamilton as written by Lin-Manuel Miranda and Jeremy McCarther. This is a review of the Hachette Audio audio book as found on Audible and narrated by the authors to some degree but predominantly by Mariska Hargitay. Hamilton was not born as a musical. It wasn't even a play. It was born as a performance at the White House as the seed of a potential "mix tape". So how did it get from a seemingly random performance for then President Obama to becoming one of the most in-demand musicals to hit New York? That's what this book aims to document by going over all the different stories of the musicals conception. And so the book follows two stories really. On the one hand there's the development of the play in itself and how it evolved from a collection of songs to a full production. And then there's the story of Alexander Hamilton itself. And to some degree the book is written in a manner that we explore the both "lives" and see how the play did its best to capture those key events. 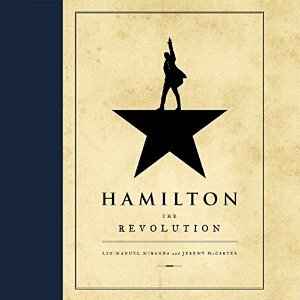 What I Liked: This glimpse into the creative process that led to Hamilton was a pretty intense sharing and I'm glad that we all get a chance to take this look through this book. And so the whole piece is like a DVD extra for a movie - a quirky featurette that is perhaps more fun as an audio experience than a written one. Mariska does a phenomenal job as acting as narrator to this journey. And the book really explores the intricasies of the thought process that went into the play. I knew it was a sort of love letter to hiphop with touches here and there but the way the book breaks down so many of the songs and what references and homages were added into things sort of boggles the mind. The cherry on top is the portion of the full libretto with Lin-Manuel's annotations to drive this point home even further. What Could Have Been Better: Greedily, I wish that Lin-Manuel Miranda had narrated more of the book and not just his notes on theb liberetto. It's a silly desire and one that relates to all the autobiographies I've listened to that were narrated by the author. The book is all about his insights and how he developed this idea into an amazing musical. And so I really wished we could have heard it through him. Just listening to his notes on the libretto shows how different an experience it is to have him as narrator. The book is quite lengthy in its efforts to go over almost every aspect of the play's development. This can either be delightful and intriguing or on the flipside it could feel tedious and a tad too long. I think it flowed pretty well as an audio book but it must make for quite the heavy reference / resource book in print. And that's a lot of ground to cover. TL;DR: Hamilton: The Revolution is a great celebration of an even greater play and is probably a must-have for any fan of the show. It's an incredibly detailed exploration of how the production was developed and that can provide a heck of a lot of insight into the genius that spawned this musical. And thus the book gets a great 5 hiphop references woven into a single song of the show as repeated across every single song in the show.